On the Eve of the Ides of March, 2019, Ernest Hilbert read from his book Last One Out for the first time during an event at the Rosenbach Museum & Library in Philadelphia. He was introduced by poet Ned Balbo and engaged in a question and answer period afterward. You can hear the entire event using the mini-player below. He reads the poems “Welcome to All the Pleasures,” “Recessional,” “My Father’s Dante,” “Ship Bottom, 1972,” “Great Bay Estuary,” “Glacier,” “Rowing in the Dawn,” “Super Bowl Sunday,” “American Glass,” and “Lesser Feasts.” Many thanks to the Rosenbach, particularly Executive Director Derick Dreher, Director of Development Kelsey Scouten Bates, and Director of Public Programs, Edward Pettit. Thanks also to all of the staff and to all who came out to fill the room at the Rosenbach! Ernest Hilbert is the kind of poet no one forgets. He is a scholar with a doctorate from Oxford University, with a dissertation on British Apocalyptic writing. He is an antiquarian book dealer who has converted his debut volume, Sixty Sonnets into a spoken word, orchestral, rock band soundtrack. He is a teacher, a librettist, and a scriptwriter for short films by Philly’s post-punk Mercury Radio Theater. 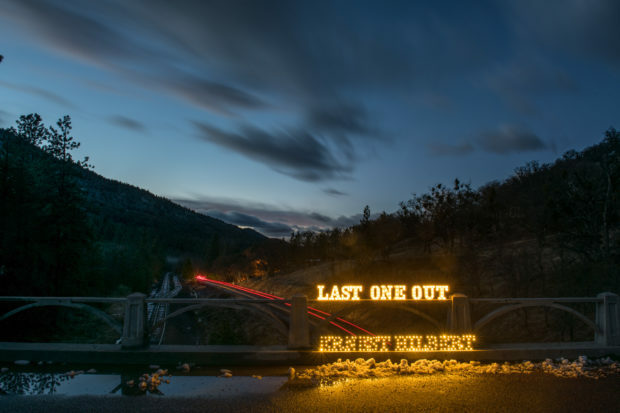 He is an archaeologist’s husband, a father, and a poet, and it is for this latter role that we are among the first to celebrate his new book, Last One Out. This poet is also an innovator, inventor of the “Hilbertian sonnet”—two sestets and a couplet unmetered or loosely metered, yet bound by the restrictions of their rhyme scheme. “He’s created his own Houdini-like set of chains to wriggle out of,” writes Maryann Corbett, another of Ernie’s gifted peers, though it’s hard to imagine chains this poet couldn’t wriggle out of. His second book, the beautiful and heartbreaking All of You on the Good Earth (its title taken from Apollo astronaut Frank Borman’s, and humanity’s, first look at Earth-rise beheld from lunar orbit), ranges widely over history and popular culture, offering us a poetry that, as Adam Kirsch observes, unites “raw energy with elegant and original language, creating a style that sounds like no one else’s.” Here, among much more, the poet gives us gods, strip clubs, zeppelins, and cats, as well as the stoic Seneca of Caligula’s era—a nod, perhaps, to what would be Ernie’s third book, Caligulan, which his peers justly rewarded with the prestigious Poets’ Prize. Another tour-de-force, Caligulan, “evokes the world we live in: we know something is wrong and, in a minute, will likely be worse; but there’s beauty in the portent and in the self-awareness we need to see it,” according to Erica Dawson. To Rowan Ricardo Phillips, Caligulan is “brutal and yet beautiful, highly refined and yet enticingly diurnal. Moved by beauty, attuned to the sublimity of natural things, livened by paradox, coaxed into song by pentameter.” Except for the word “brutal,” it’s an apt description of the poet himself. We hurt as much from what we half-forget / As from the things we carefully conserve. Given the gravity, care, and achievement of Last One Out and its predecessors, I’d like to express thanks for the honor of welcoming this poet of unique vision and singular talent, Mr. Ernest Hilbert.